There are certain movies and television shows people watch knowing full well that much of what's on screen has been added afterwards. Until genetic engineering allows us to create dragons and sea monsters for less money than it takes to model them in Maya, this is just the way things are. But special effects are increasingly cropping up in movies you wouldn't have thought needed them. Take Martin Scorcese's debauched take on the American financial industry, The Wolf Of Wall Street. The studio responsible for the SFX in the film, Brainstorm Digital, has released a reel breaking down the special effects shots. 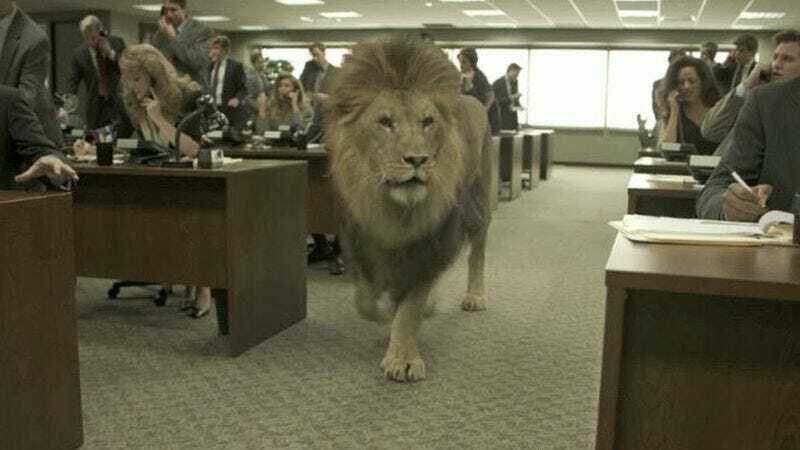 Some of them are shots you probably could have guessed were worked over, like the one involving a lion walking through main character Jordan Belfort's office. But others, like one where the folks at Brainstorm switched out the facade of a London townhouse, come as a surprise. It's just another step toward a glorious time when even over-the-shoulder shots in romantic comedies will be the results of months of green screen work.